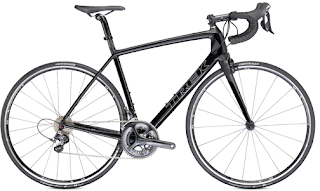 In our new 2013 Trek lineup, now in stock at our bike shops in Clarksville, IN, Lexington, and Louisville, we are showing the 2013 Madone 3.1, a lightweight road and racing machine built with Trek's H2 geometry. 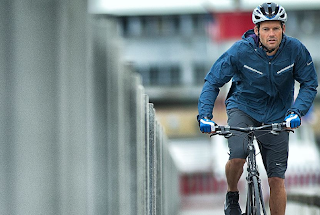 Check out this short video about this latest model from Trek. The frame is ultra light, built with the 300 Series OCLV Carbon, and including a carbon road fork. The carbon construction means this bike weighs in at about 165 grams less than an aluminum frame counterpart. The Madone utilizes Shimano total integration, allowing the rider to shift gears and brake from the same place, without lifting hands from the handlebars. The Shifters are Shimano 105 10 speed, attached to the Shimano Tiagra front derailleur as well as the Shimano 105 rear derailleur. Having all these shimano parts makes for effortless compatibility, ensuring that you will always achieve a smooth, confident shift. Road enthusiasts, come into one of our five Scheller's locations to take this brand new bike for a spin, and check out others from our 2013 lineup.